Materials needed: one toilet paper tube for each character, 3x4 inch fabric squares, assorted colors and peach construction paper, wide rubber bands (colored preferred), for baby: peanut and cloth strip, Spanish moss or straw, and fine tip pen to draw faces. 1. Cut construction paper to fit tubes and glue around tube. 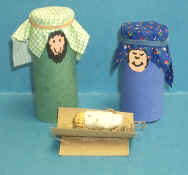 Cut the tubes different sizes, Mary should be a little shorter than Joseph. Fasten with clothes pins on the ends until glue dries so you don't have to hold in place so long. 2. Drape the cloth rectangle over top of tube and secure with a rubber band to form a head covering. 3. Cut oval face shapes out of peach construction paper and glue on, color on eyes and mouths, hair and noses, add a beard for Joseph. 4. For manger cut a tube in half, then again in half- from side to side you should end up with two curved pieces. Glue them together opposite ways for the manger, add moss or straw. 5. For baby select a long even shaped peanut in shell and wrap with a cloth strip, then draw a face.